The tale tells the adventures of an extraordinary pet. Half violin, half rock guitar, Strings is a very special dog. Strings meets Big Weeper at its morning stroll. Big Weeper is a tree with branches that are made of tears that come out from its many eyes. Our hero is sad because it is attached with five ropes. It will not stop until it gets rid of them, so that it can undertake new ventures with its friends Wind and Percussion. The 12 games that are included in this App are related to each sequence of the tale and they develop the vocabulary and the subjects that are treated in the story. This facilitates learning concepts like freedom, solidarity, companionship, empathy. This is a collection of games where the child will tell stories, play music, do karaoke, discover hidden treasuries, recognise forms, get to know music instruments, recognised body expressions, celebrate birthday, etc. Strings is an original child story within the experimental avantgarde tradition, which takes stock of the research on the relationship between art and didactics. 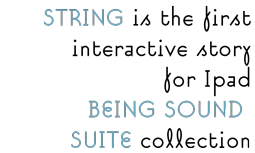 Strings favours the child's experience of reading by integrating learning and entertainment. Playing music on a scale of digital strings. surprised, angry or crying joker. Meet the animals and musical families. Discover treasures in remote places. Birthday and blow out the candles. Sing karaoke the story song. Story tale over 12 pages. High-quality 3D illustrations, animations and interactions. Strings is a tale that unfolds in 12 interactive scenes through animation and sound inviting children to a special environment of images and music. bird and frog protagonists of new stories in this series.